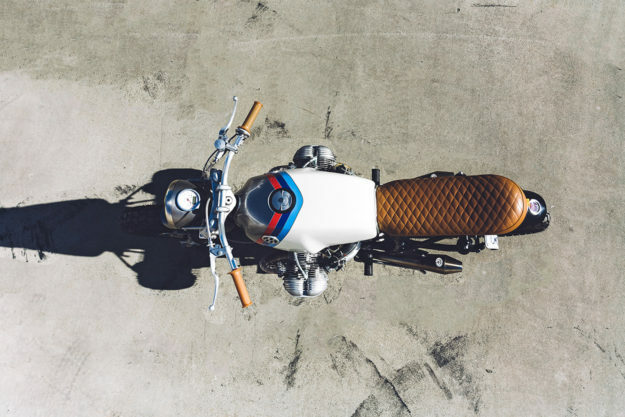 Unless you’re immersed in every corner of the custom world, you probably associate Untitled Motorcycles with one bike: the amazing Hyper Scrambler Ducati, built in San Francisco. Our article triggered a media frenzy that culminated in an appearance on Jay Leno’s Garage. But the mark of a good shop is the ability to turn a worn-out older bike into a thing of beauty. And that’s what designer Hugo Eccles has done with ‘Kalifornia,’ Untitled’s latest build. 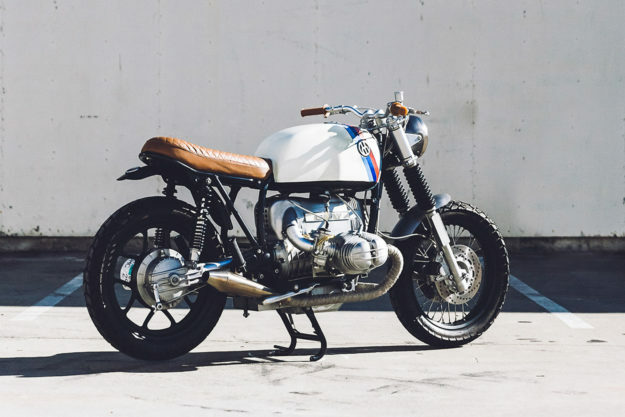 Based on a 1983 BMW R100, it’s a fabulous mix of Californian bravado and German cool. 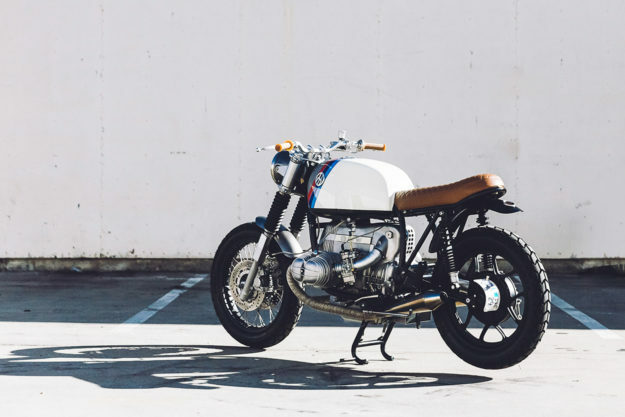 The engine, stripped and vapor-blasted to its natural aluminum, now breathes through a pair of Dell’Orto PHM-38 carbs—as used on the R90S—with custom stainless steel manifolds and one-of-a-kind aluminum airbox tubes. The stock plastic airbox cover and starter cover have both been replaced with the earlier metal versions. The BMW nameplate, normally black, is painted in the same cream as the fuel tank. UMC have kept the stock headers, insulated them with grey exhaust wrap, and slotted on custom stainless steel silencers by Cone Engineering. The ‘mismatched’ front and rear wheels are intentional, a style borrowed from the cycling world. “I’ve always liked the tension of having a cast wheel paired with a spoked wheel,” says Eccles. In fact, neither of the wheels is original. 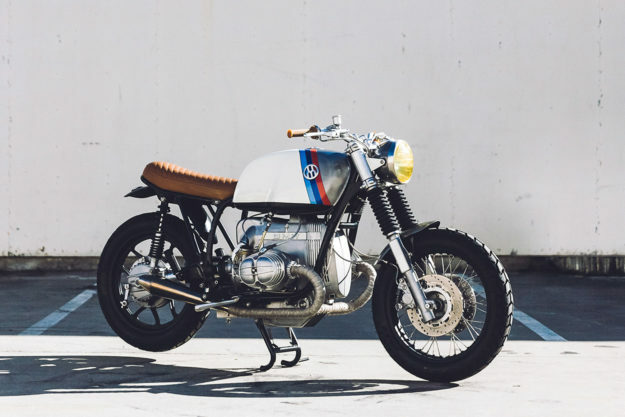 The factory cast snowflake wheels were ditched early in the project and the original 19″ front wheel replaced with a 18″ rear rim, laced with stainless steel spokes to a modified BMW 2-rib hub. 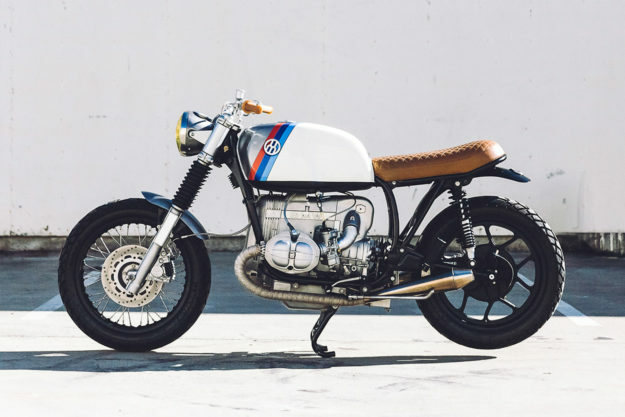 The BMW’s gauges and controls have been completely overhauled and replaced with a custom headlight, housing an analogue Motogadget speedometer and modified Posh switchgear. Hidden internal wiring is routed through the low-rise Renthal handlebars. A modern Nissin master cylinder controls the twin Brembo calipers and EBC deep-dish rotors on the spoked front wheel. The BMW’s battery is linked to an upgraded EnDuraLast charging system for modern reliability. 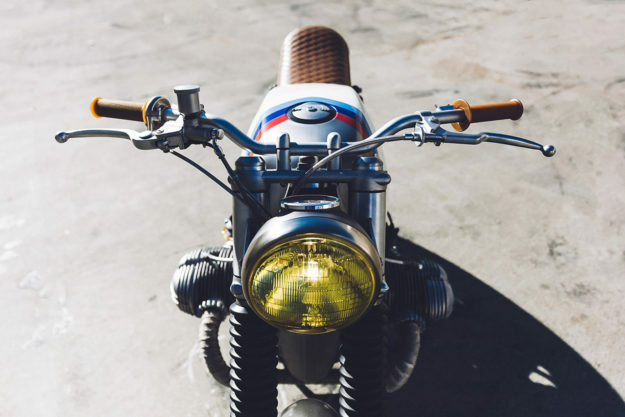 The bike was completely rewired from head to toe with an m-Unit and m-Lock keyless ignition system from Motogadget, activated by a tiny RFID capsule sewn into the owner’s glove. The most distinctive element is the paint and finish, though. 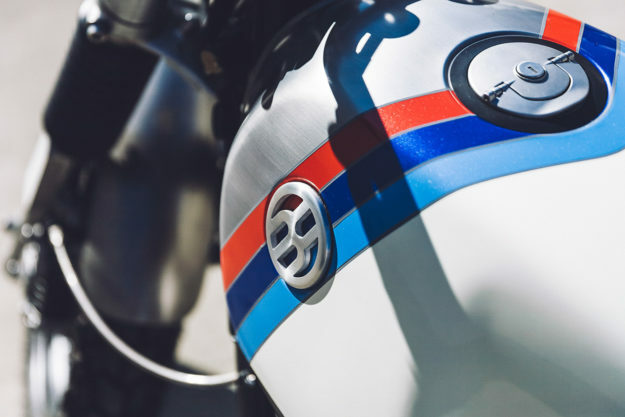 “I wanted to retain a connection to the original motorcycle, using BMW Motorsport stripes but with a twist.” So the classic ‘M’ colors have been reinterpreted in a deep metallic flake. 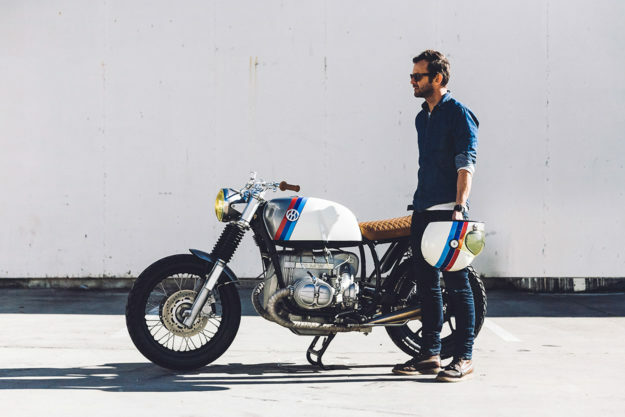 “It’s BMW meets Evel Knievel,” jokes Eccles. The metallic blue and red stripes run parallel with the forks, and visually separate the front and the rear of the bike. 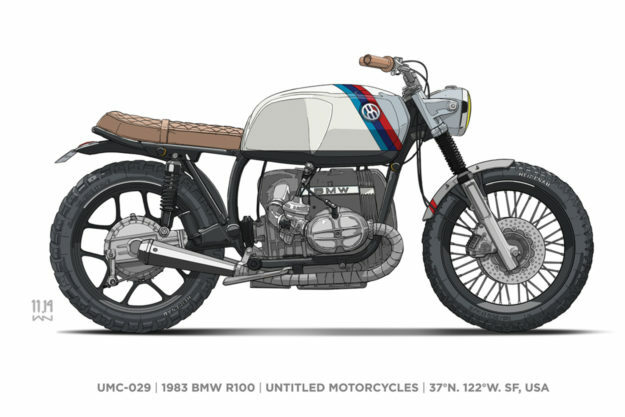 Ahead of the stripes, the motorcycle is raw metal, stripped, brushed, and clear-coated to preserve the finish. 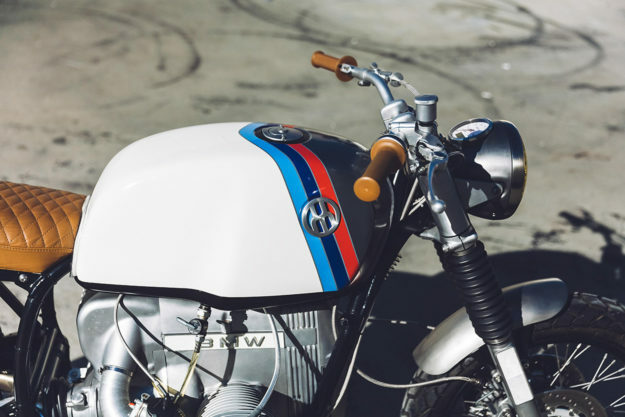 Behind the stripes, the original fuel tank has been painted in a luscious solid cream. Sourcing the Porsche color proved an unexpected challenge: over the years Porsche has created different versions of ‘Ivory’ that vary from a warm white to a pale grey. “I eventually found a Porsche in the correct original color, and matched the paint by hand,” explains Eccles. Tiny, almost-invisible, Motogadget m-Blaze turn signals are integrated onto the frame, and a low-profile LED taillight has been ‘frenched’ into the rear mudguard. Original main frame, de-tabbed, powdercoated. Reconditioned Koni shocks, powdercoated springs. 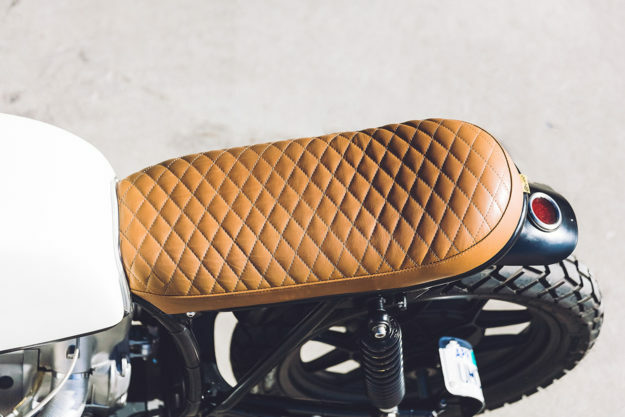 Custom cross-stitched tan leather seat by Acker Leather Works. Original 19″ front wheel replaced with 18″ rear rim, stainless steel spokes. R65LS 18″ cast ‘Y’ style rear wheel. Michelin Sirac 4.1 x 18″ tires. EBC ‘deep dish’ brake rotors. Original forks, stripped, custom white reflectors, rubber gaiters. Upgraded fork internals, custom nylon spacers. Modified BMW ‘2-rib’ front hub. Original Brembo calipers, stripped, vapor-blasted, rebuilt, reconditioned. Original foot peg mounts, modified to fit /5 rubber rests. R65LS rear drive hub, stripped, vapor-blasted. Custom hub-mounted license plate bracket with integrated LED plate light. Brown side stand, welded to frame. Modified center stand, shortened, powdercoated. Custom Dynamics LED taillight, ‘frenched’ into the rear fender. Motogadget m-Unit control module and m-Lock RFID keyless ignition. UMC custom headlight with integrated Motogadget speedometer. WestCo gel battery installed in stainless steel UMC battery box. Twin dual-tone 120dB horns, hidden under the fuel tank. Motogadget m-Blaze LED turn signals front and rear. Motogadget Motoscope Classic speedometer integrated into custom headlight. Nissin 13mm brake master cylinder with 1-into-2 braided stainless steel lines. Nissin clutch lever with braided stainless steel cable. Custom Momo throttle with braided stainless steel cable. Classic BSA-style aluminum throttle cable splitter. Renthal 22mm (7/8″) ultra low handlebars, modified Posh switches, internal wiring. Custom cast aluminium top bracket. Upgraded EnDuroLast charging system . Classic metal airbox cover, drilled. Metal starter cover with painted ‘BMW’ nameplate. Clear fuel line by Helix Racing. Upgraded pistons, pushrods, stainless pushrod tubes. Stainless steel Cone exhausts with custom brackets. Magnum Shielding braided stainless steel spark leads. Custom stainless steel inlet manifolds. Original steel petrol tank, stripped, brushed, clear coated, painted by Motojrefinish. Custom steel headlight housing, brushed and clear coated. Seat upholstered in tan brown leather by Acker Leather Works. Brushed steel front fender, welded to fender bracket, clear coated. Custom rear fender, powdercoated in satin black. Bell Bullitt helmet, yellow shield, painted by Motojrefinish.